There are only two more rounds left in the Regular Season in B2 League. The fans could enjoy quite many interesting games in the last round. The round ended with defeat of the leader, favorites losing the games and games ending by tiny margin. Here is the last round review presented by ESL. The most crucial game of the last round was a loss of top-ranked Gunma (42-16) at the home court on Sunday night. Hosts were defeated by second ranked Sendai 89ers (38-20) 97-86. It ended at the same time the six-game winning streak of Gunma. It may be a crucial game in the contest for the top position in the league. Sendai 89ers made 22-of-25 free shots (88.0 percent) during the game. Sendai 89ers outrebounded Gunma 32-20 including 23 on the defensive glass. They looked well-organized offensively handing out 22 assists. Worth to mention a great performance of American forward Jerome Tillman (201-87, college: Ohio, agency: Inception Sports) who helped to win the game recording 32 points and 9 rebounds. The other American import center Daniel Miller (211-91, college: Georgia Tech) contributed with 14 points, 11 rebounds and 6 assists for the winners. American forward Thomas Kennedy (201-87, college: Detroit Mercy) replied with 29 points and 5 rebounds for Gunma. Gunma's coach Fujitaka Hiraoka rotated ten players in this game, but that didn't help. Sendai 89ers maintains second position with 38-20 record having four points less than leader Shinshu BW. Gunma at the other side still keeps top place with 16 games lost. They share the position with Shimane SM. Sendai 89ers are looking forward to face Aomori Watts (#6) at home in the next round. Gunma will play against Yamagata (#5) and is hoping to win this game. Important game to mention about took place in Nagoya. Second ranked Toyotsu FE (40-18) saved a 1-point victory at home edging top-ranked Shinshu BW (46-12) 73-72 on Sunday evening. It ended at the same time the five-game winning streak of Shinshu BW. It may be a crucial game in the contest for the top position in the league. American forward Josh Hawkinson (208-95, college: WSU) had a double-double by scoring 23 points, 12 rebounds and 6 assists to lead the charge for the winners and Garrett Stutz chipped in 15 points, 10 rebounds and 6 assists during the contest. 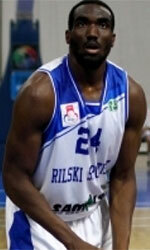 At the losing side American swingman Richard Roby (198-85) responded with 14 points and 6 rebounds. Both coaches used bench players in such tough game. Toyotsu FE maintains second position with 40-18 record having just two points less than leader Shinshu BW. Shinshu BW at the other side still keeps top place with 12 games lost. Toyotsu FE will play against Tokyo Z (#4) on the road in the next round. Shinshu BW will play against Tokyo HT and hopes to get back on the winning track. A very close game took place in Aomori between Aomori Watts and Cyberdyne IR. Sixth ranked Aomori Watts (15-43) got a very close home victory over 3rd ranked Cyberdyne IR (35-23). Aomori Watts managed to escape with a 3-point win 74-71 on Sunday evening. It ended at the same time the two-game winning streak of Cyberdyne IR. Toshio Kan notched a double-double by scoring 14 points, 10 rebounds and 4 assists to lead the effort. Even a double-double of 17 points, 15 rebounds and 9 assists by Scootie Randall did not help to save the game for Cyberdyne IR. Both coaches tested many bench players in such tough game. Aomori Watts maintains sixth position with 15-43 record. Loser Cyberdyne IR keeps the third place with 23 games lost. Aomori Watts will meet league's second-placed Sendai 89ers on the road in the next round and it may be quite challenging game. Cyberdyne IR will play against Fukushima and it may be a tough game between close rivals. Very important is a road loss of third ranked Dragonflies (32-26) against fifth ranked Bambitious Nara (20-38) on Sunday night. Visiting Dragonflies were defeated by Bambitious Nara in Nara 90-79. Gary Hamilton fired a double-double by scoring 18 points, 16 rebounds and 7 assists for the winners. Both coaches allowed to play bench players saving starting five for next games. Bambitious Nara moved-up to fourth place, which they share with Ehime OV. Dragonflies lost third consecutive game. Newly promoted team keep the third position with 26 games lost. Bambitious Nara's next round opponent will be Orange Vikings (#4) in Matsuyama. Dragonflies will play at home against the league's leader Kumamoto V. and it may be a tough game between close rivals. An interesting game for Shimane Magic (42-16) which hosted in Shimane 4th ranked Orange Vikings (20-38). Second ranked Shimane Magic had an easy win 84-68. It was a very good performance for Rosco Allen who helped to win the game recording a double-double by scoring 19 points, 18 rebounds and 6 assists. Both coaches allowed to play bench players saving starting five for next games. Shimane Magic keeps a position of league leader, which they share with Gunma. Loser Orange Vikings keep the fourth place with 38 games lost. Shimane Magic will face Kagawa FA (#6) in Takamatsu in the next round where they are favorite. Orange Vikings will play at home against Bambitious Nara and it may be a tough game between close rivals. Other games in round 58 were not that significant. Yamagata was smashed by Fukushima on the road 104-77. Kanazawa Sam. won against Tokyo Z on its own court 79-73. Kagawa FA unfortunately lost to Kumamoto V. in a road game 81-91. The most impressive performance of 58th round was 19 points, 10 rebounds and 4 assists by Chehales Tapscott of Kumamoto V.. The most crucial game of the last round was a loss of top-ranked Gunma (42-16) at the home court on Sunday night. Hosts were defeated by second ranked Sendai 89ers (38-20) 97-86. It ended at the same time the six-game winning streak of Gunma. It may be a crucial game in the contest for the top position in the league. Sendai 89ers made 22-of-25 free shots (88.0 percent) during the game. Sendai 89ers outrebounded Gunma 32-20 including 23 on the defensive glass. They looked well-organized offensively handing out 22 assists. Worth to mention a great performance of American forward Jerome Tillman (201-87, college: Ohio, agency: Inception Sports) who helped to win the game recording 32 points and 9 rebounds. The other American import center Daniel Miller (211-91, college: Georgia Tech) contributed with a double-double by scoring 14 points, 11 rebounds and 6 assists for the winners. Four Sendai 89ers players scored in double figures. American forward Thomas Kennedy (201-87, college: Detroit Mercy) replied with 29 points and 5 rebounds and Nigerian forward Abdullahi Kuso (206-84, college: Tallahassee CC) added 7 points and 9 rebounds in the effort for Gunma. Gunma's coach Fujitaka Hiraoka rotated ten players in this game, but that didn't help. Sendai 89ers maintains second position with 38-20 record having four points less than leader Shinshu BW. Gunma at the other side still keeps top place with 16 games lost. They share the position with Shimane SM. Sendai 89ers are looking forward to face Aomori Watts (#6) at home in the next round. Gunma will play against Yamagata (#5) and is hoping to win this game. An interesting game for Shimane Magic (42-16) which hosted in Shimane 4th ranked Orange Vikings (20-38). Second ranked Shimane Magic had an easy win 84-68. Shimane Magic outrebounded Orange Vikings 49-24 including a 34-18 advantage in defensive rebounds. They looked well-organized offensively handing out 26 assists. It was a very good performance for Hungarian-American Rosco Allen (208-93, college: Stanford, agency: Pensack Sports) who helped to win the game recording a double-double by scoring 19 points, 18 rebounds and 6 assists. Venezuelan center Gregory Echenique (206-90, college: Creighton, agency: Pensack Sports) contributed with a double-double by scoring 18 points, 21 rebounds and 4 blocks for the winners. Four Shimane Magic players scored in double figures. American power forward Cory Johnson (202-88, college: Valpo) replied with 22 points, 6 rebounds and 6 assists and his fellow American import swingman Lakeem Jackson (195-90, college: S.Carolina, agency: SDJ Sports) added 22 points and 7 rebounds in the effort for Orange Vikings. Both coaches allowed to play bench players saving starting five for next games. Shimane Magic keeps a position of league leader, which they share with Gunma. Loser Orange Vikings keep the fourth place with 38 games lost. Shimane Magic will face Kagawa FA (#6) in Takamatsu in the next round where they are favorite. Orange Vikings will play at home against Bambitious Nara and it may be a tough game between close rivals. The game between closely ranked teams ended with fourth ranked Fukushima's (25-33) home victory over 5th ranked Yamagata (21-37) 104-77 on Sunday. Fukushima looked well-organized offensively handing out 26 assists. Quite impressive performance for American power forward Evan Ravenel (204-89, college: Ohio St.) who helped to win the game recording a double-double by scoring 32 points, 10 rebounds and 5 assists. The other American import center Chris Brady (208-95, college: Monmouth) contributed with a double-double by scoring 20 points, 15 rebounds and 4 assists for the winners. Four Fukushima players scored in double figures. Nigerian forward Chukwudiebere Maduabum (206-91) replied with a double-double by scoring 19 points and 12 rebounds and guard Yoshifumi Nakajima (176-90) added 18 points, 5 rebounds and 5 assists in the effort for Yamagata. The winner was already known earlier in the game, so both coaches allowed to play the bench players saving starting five for next games. Fukushima maintains fourth position with 25-33 record which they share with defeated Yamagata. Loser Yamagata dropped to the fourth place with 37 games lost. Fukushima will face higher ranked Cyberdyne IR (#3) in Tsukuba in the next round and it may be the game of the week. Yamagata will play at home against the league's leader Gunma and hope to win that game. A very close game took place in Aomori between Aomori Watts and Cyberdyne IR. Sixth ranked Aomori Watts (15-43) got a very close home victory over 3rd ranked Cyberdyne IR (35-23). Aomori Watts managed to escape with a 3-point win 74-71 on Sunday evening. It ended at the same time the two-game winning streak of Cyberdyne IR. Point guard Toshio Kan (184-94) notched a double-double by scoring 14 points, 10 rebounds and 4 assists to lead the effort and South Sudanese forward Mogga Lado (201-95, college: Campbell) supported him with 13 points and 7 rebounds. Four Aomori Watts players scored in double figures. Even a double-double of 17 points, 15 rebounds and 9 assists by American forward Scootie Randall (198-90, college: Temple) did not help to save the game for Cyberdyne IR. His fellow American import forward Connor Lammert (206-94, college: Texas) added 17 points and 12 rebounds for lost side. Both coaches tested many bench players in such tough game. Aomori Watts maintains sixth position with 15-43 record. Loser Cyberdyne IR keeps the third place with 23 games lost. Aomori Watts will meet league's second-placed Sendai 89ers on the road in the next round and it may be quite challenging game. Cyberdyne IR will play against Fukushima and it may be a tough game between close rivals. We cannot really consider it an upset in the game between close teams when one of their biggest challengers Tokyo Z (21-37) lost to fifth ranked Kanazawa Sam. (21-37) in Ishikawa 73-79 on Sunday. Kanazawa Sam. looked well-organized offensively handing out 23 assists. Quite impressive performance for American power forward Denzel Bowles (208-89, college: JMU) who helped to win the game recording 18 points, 5 rebounds and 6 assists. Jamaican-American power forward Ryan Reid (204-86, college: FSU) contributed with a double-double by scoring 16 points, 10 rebounds and 4 blocks for the winners. Kanazawa Sam. 's coach Hotta Takeshi used a ten-player rotation which allowed the starters a little rest for the next games. Australian power forward Daniel Johnson (212-88, college: Pepperdine) replied with a double-double by scoring 16 points and 11 rebounds and American forward Jahmar Thorpe (198-84, college: Houston) added 17 points, 5 rebounds and 4 assists in the effort for Tokyo Z. Kanazawa Sam. moved-up to fourth place, which they share with Tokyo Z and Yamagata. Kanazawa Sam. will face higher ranked Nishinomiya S. (#3) in Hyogo in the next round and it may be the game of the week. Tokyo Z will play at home against the league's second-placed Toyotsu FE and it may be a tough game between close rivals. Important game to mention about took place in Nagoya. Second ranked Toyotsu FE (40-18) saved a 1-point victory at home edging top-ranked Shinshu BW (46-12) 73-72 on Sunday evening. It ended at the same time the five-game winning streak of Shinshu BW. It may be a crucial game in the contest for the top position in the league. Toyotsu FE players were unselfish on offense dishing 26 assists. American forward Josh Hawkinson (208-95, college: WSU) had a double-double by scoring 23 points, 12 rebounds and 6 assists to lead the charge for the winners and the other American import center Garrett Stutz (214-90, college: Wichita St.) chipped in 15 points, 10 rebounds and 6 assists during the contest. At the losing side American swingman Richard Roby (198-85) responded with 14 points and 6 rebounds and point guard Yuta Osaki (179-94) scored 9 points, 5 rebounds and 6 assists. Both coaches used bench players in such tough game. Toyotsu FE maintains second position with 40-18 record having just two points less than leader Shinshu BW. Shinshu BW at the other side still keeps top place with 12 games lost. Toyotsu FE will play against Tokyo Z (#4) on the road in the next round. Shinshu BW will play against Tokyo HT and hopes to get back on the winning track. Very important is a road loss of third ranked Dragonflies (32-26) against fifth ranked Bambitious Nara (20-38) on Sunday night. Visiting Dragonflies were defeated by Bambitious Nara in Nara 90-79. Bambitious Nara players were unselfish on offense dishing 27 assists. American power forward Gary Hamilton (208-84, college: Miami, FL, agency: Inception Sports) fired a double-double by scoring 18 points, 16 rebounds and 7 assists for the winners. Point guard Makoto Higuchi (177-92) chipped in 23 points and 6 assists (on 9-of-10 shooting from the field). American forward Terrell Miller-Jr (203-95, college: Murray St., agency: Duran International) produced 14 points, 6 rebounds and 4 assists and point guard Hiryu Okamoto (170-93) added 9 points, 5 rebounds and 4 assists respectively for lost side. Both teams had four players each who scored in double figures. Both coaches allowed to play bench players saving starting five for next games. Bambitious Nara moved-up to fourth place, which they share with Ehime OV. Dragonflies lost third consecutive game. Newly promoted team keep the third position with 26 games lost. Bambitious Nara's next round opponent will be Orange Vikings (#4) in Matsuyama. Dragonflies will play at home against the league's leader Kumamoto V. and it may be a tough game between close rivals. Very predictable result when first ranked Kumamoto V. (43-15) won against at home 6th ranked Kagawa FA (18-40) 91-81 on Sunday. Kumamoto V. looked well-organized offensively handing out 21 assists. Kagawa FA was plagued by 24 personal fouls down the stretch. Quite impressive performance for Dutch-Australian power forward Josh Duinker (209-89, college: Richmond) who helped to win the game recording 24 points and 9 rebounds. American forward Chehales Tapscott (195-90, college: Portland St.) contributed with a double-double by scoring 19 points, 10 rebounds and 4 assists for the winners. Four Kumamoto V. players scored in double figures. American guard Terrance Woodbury (201-87, college: Georgia) replied with a double-double by scoring 22 points and 13 rebounds and his fellow American import forward Reginald Warren (204-81, college: W.Florida, agency: Inception Sports) added 22 points and 11 rebounds in the effort for Kagawa FA. Kumamoto V. have an impressive ten-game winning streak. They maintain first position with 43-15 record. Loser Kagawa FA keeps the sixth place with 40 games lost. Kumamoto V. will face Dragonflies (#3) in Hiroshima in the next round, which may be the game of the day. Kagawa FA will play at home against the league's second-placed Shimane Magic and hope to win that game.